Stuck in Tiny Singapore: Therapy Dogs Singapore - Come and volunteer with us! Therapy Dogs Singapore - Come and volunteer with us! Since I have stopped working, I have always put some of my leisure time into volunteering work. When I was in the UK, I used to volunteer for Leonard Cheshire and Age Concern as a befriender. Quinton and Reegan used to come with me to the visits as in the UK, there are mostly dog-friendly.When I was in HK, I had wanted to enrol Reegan into the Dr Dogs programme by Animal Asia, but they require a dog to be over 2 years old. So I had to wait till she is 2 before I can register her. Unfortunately I moved back to Singapore before I could do that. Instead of just being a tai tai being bored at home, I decided to look for volunteer positions again in Singapore and I found Therapy Dogs Singapore. 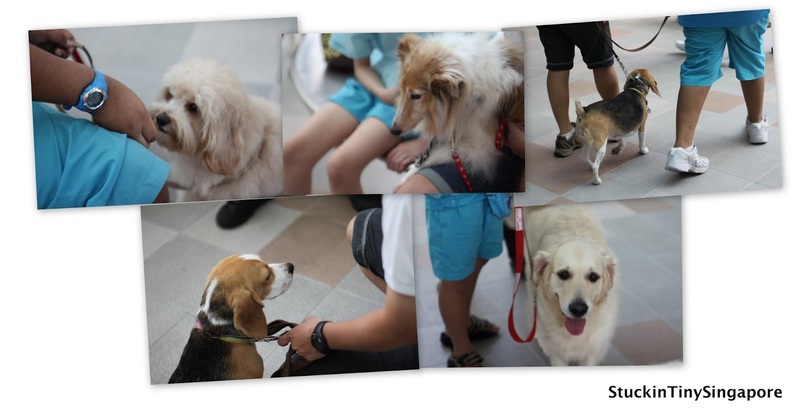 Therapy Dogs Singapore is formed by a group of dog lovers who wanted to share the love and joy of their dogs with the less fortunate in the society. Charlie Ho is the founder and there are a group of lovely people among the volunteers. I have now been volunteering with them for 2 years and have been heavily involved in the running of the group. I have to say it is an amazing group and the work we do here is great. We concentrate mainly on Animal Assisted activities (AAA) which is where we visit our seven adopted homes with our dogs. During the visits, the residents of the homes can interact with our dogs, from patting them, brushing or feeding to walking the dogs. The reward is when you hear the laughter or see their big smiles having spent an hour with our canine volunteers. The other type of activity we do is call Animal Assisted Therapy (AAT) where it is more of a one-to-one programme where a medical professional (Physiotherapists/Occupational Therapists/Nurse/Doctor) is present. There is a set goal and the session is more targeted. For example if you have a patient who has recently suffered from a stroke and is refusing to do physiotherapy. If the patient loves dogs, having a dog around to motivate the patient to do his exercise e.g like throwing a ball for the dog to fetch, is an example of some of the exercises carried out during AAT. AAT is being used a lot in the West, but in Asia, we still lack behind due to the lack of understanding and the mindset of people towards dogs. There have been so many documented cases of how dogs or animals can help us in various areas - like dealing with stress, emotional pain etc. 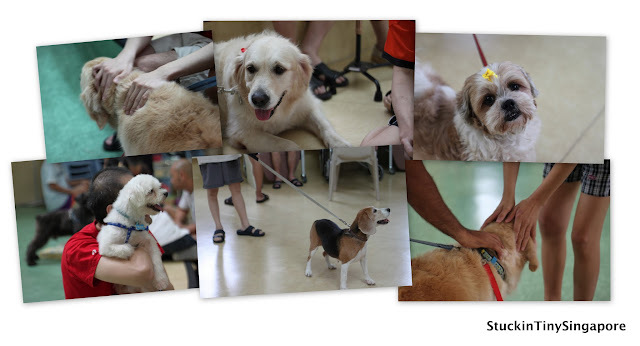 If you are interested to learn more about Therapy Dogs Singapore, go to our website (http://www.tdspore.org) . In the meantime, here are some pictures of our therapy dogs at work.